Motorola just can’t keep this baby on a short leash before the official announcement. The DROID X2 has already leaked numerous times in the past few weeks. There is almost no detail that hasn’t become clear already – specifications, pictures and even the release date. What’s the today’s leak about then? 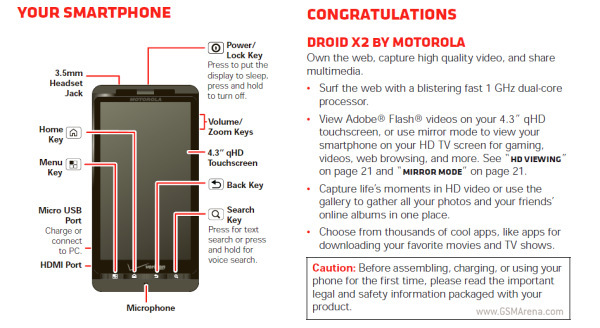 It’s the Motorola DROID X2 manual, uploaded directly on the Motorola’s official support website. The manual brings no surprises, previously leaked specs seem accurate as well as the leaked pictures. You can get a glimpse of what the Motorola DROID X2 is about, just hit the source link below. The DROID X2 should hit the stores on 26 May, while the pre-orders will ship as early as 19 May according to the Verizon’s leaked schedule. We guess if the DROID X2 won’t get announced in the next two days, it might turn up wrong.